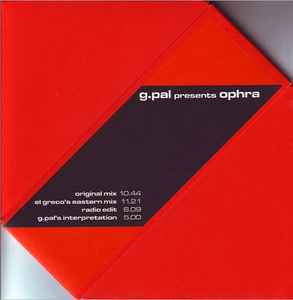 G-Pal presents OPHRA is a project of George Pallikaris remixing the Israeli singer Ofra Haza. The vocals originate from Ofra's song: My Soul (Kol Haneshama). The original mix is amazing and the production fits perfectly with the feeling of the vocals. El Greco Eastern Mix is a (more) progressive remix. G-Pal's "Interpretation" mix is just beautiful. Incredible track. It seems to be a specialty of G-Pal's to do chilled-out melodic house mixes for other Greek artists: check out his "Summer Dream of Tonight" mix of Futuristic - Tonight and his "Dreamworks" mix of Tone Depth & Sultan - Broken. Both amazing tracks. Apparently, this man never runs out of inspiring, emotional melodies.